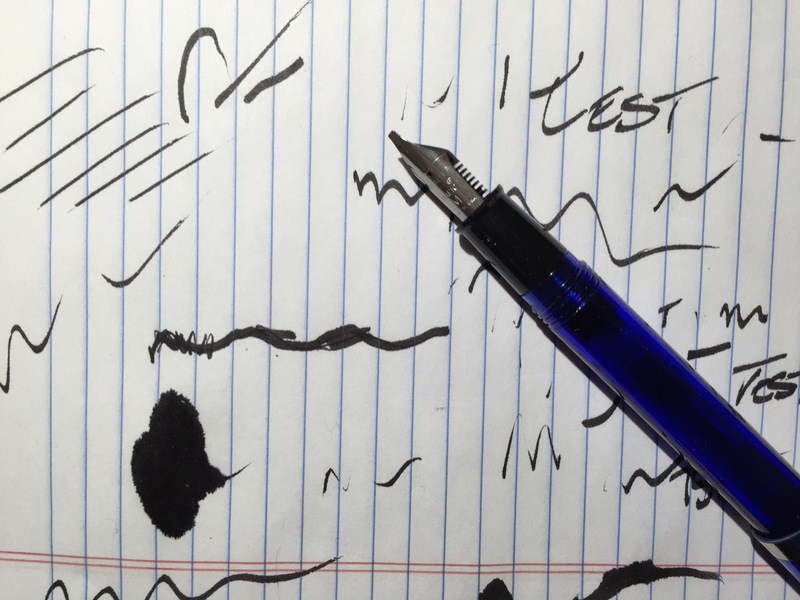 Note: this post is the third part of a series in which I’m learning about fountain pens. For Part 1, click here. For part 2, click here. One bonus that comes from having a blog about pens is that I occasionally get some interesting hand-me-downs. This Sheaffer Caligrapher is a good example. Purchased sometime in the 1980s, it was found by my mom at the bottom of her desk drawer, where it sat in its original packaging, unopened and with two black-ink cartridges. After my bad experience with the Zebra V-301, I was eager to break open the packaging of a new fountain pen and pop one of the ink cartridges in. I gave the cartridge a squeeze to get the ink flowing, and to my surprise, this 30-year-old pen began to write without any issues (though I did manage to make a small mess). Up until now, I haven’t gotten into much detail about nibs. The nib is the tip of the fountain pen; the part the touches the paper and distributes ink to the page. There are a lot of different nib styles – fine point, medium point, stub, flex, etc. And a fountain pen will produce different line variations, depending on the type of nib being used. 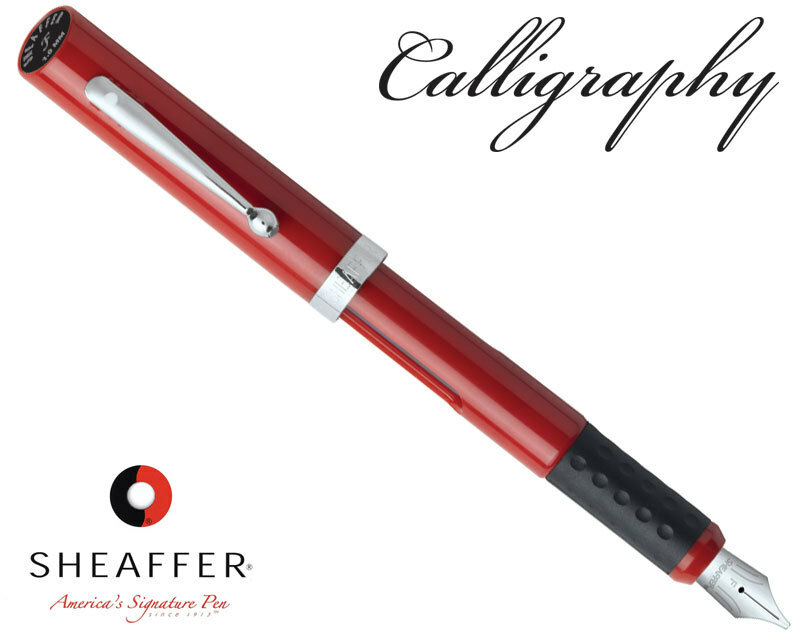 The Shaffer Calligrapher uses an italic nib, which has a tip that flattens out into a broad area. Rather than providing a consistent line width, this nib design is meant to produce broad horizontal lines and thin vertical lines. And If you hadn’t guessed by this pen’s name, it makes an ideal tool for calligraphy. As far as I can tell, the Sheaffer Calligrapher is an older model of the Sheaffer Viewpoint, which sells for under $10 and is commonly bundled with special calligraphy sets. The Calligrapher is built nicely for this purpose, too. It has a threaded cap with a flat end that can stand up vertically when posted, making it ideal for longer writing sessions. Surprisingly, it’s also a pretty durable pen. I inadvertently threw it in my backpack where it banged around for a week, and when I took it out to write, it still worked great. All said and done, It was nice to use the Calligrapher. It’s a good-quality pen at a low price, however, I can also tell that it isn’t the right pen for me. I’d like a pen that’s more practical for every day use and something that fits my block writing style better. In the mean time, the Calligrapher will rest in slot number three on my fountain pen stand, waiting until the next time I need to write a thank you note. This is the calligraphy version of the Sheaffer NoNonsense fountain pen of the 70s. I have a few of the regular nib version – they’re easy to come by and inexpensive on eBay. Just be aware that a lot of people have listed the calligraphy or “italic” nib version, which is what you already have here. The regular nib one is what you want. Also, the opaque body pens are older than the transparent ones. The NoNonsense was the first fountain pen I used in elementary school, and it was one of those “gotta have it” things with the kids at the time, like the Bic four-color pens that first came out around that time (early 70s). Awesome. Thanks for the info. There also seems to be a lot of neat designs on eBay for the NoNonsense. I’ll have to look around more, and maybe pick up one with a medium or fine nib.